March is National Nutrition Month! National Nutrition Month is a nutrition education and information campaign created annually in March by the Academy of Nutrition and Dietetics. The campaign focuses on the importance of making informed food choices and developing sound eating and physical activity habits. You can celebrate National Nutrition Month not only from a nutritional standpoint, but also by taking into account all four pillars when it comes to healthy habits. These four pillars include: healthy eating, physical activity, duration and quality of sleep, and emotional well-being. All are crucial when it comes to living an overall healthy lifestyle. For instance, if you consume healthy meals and snacks, you will have more energy to be active and engage in some sort of physical activity. Receiving the proper amount of sleep the night before will also provide you with a substantial amount of energy to go about the days activities as well. By doing all of the above, your mental health and emotional well-being will be positively affected. The other pillars are able to relieve stress and boost overall mood. As you can see, each and every pillar works in cohesion with one another in order to bring out the best and most healthy version of you. 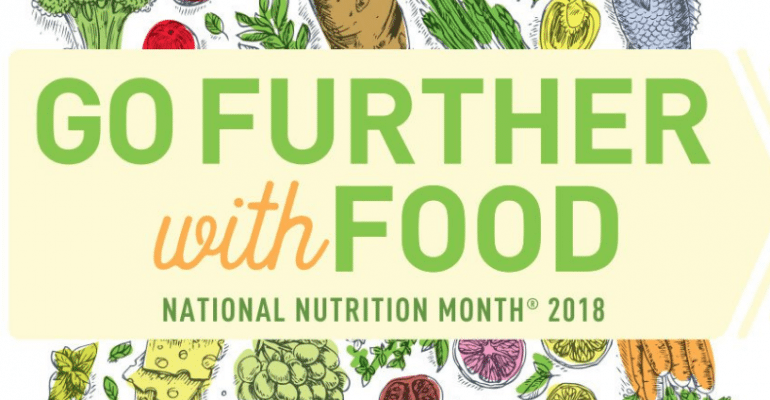 The 2018 theme for National Nutrition Month is “Go Further With Food”. 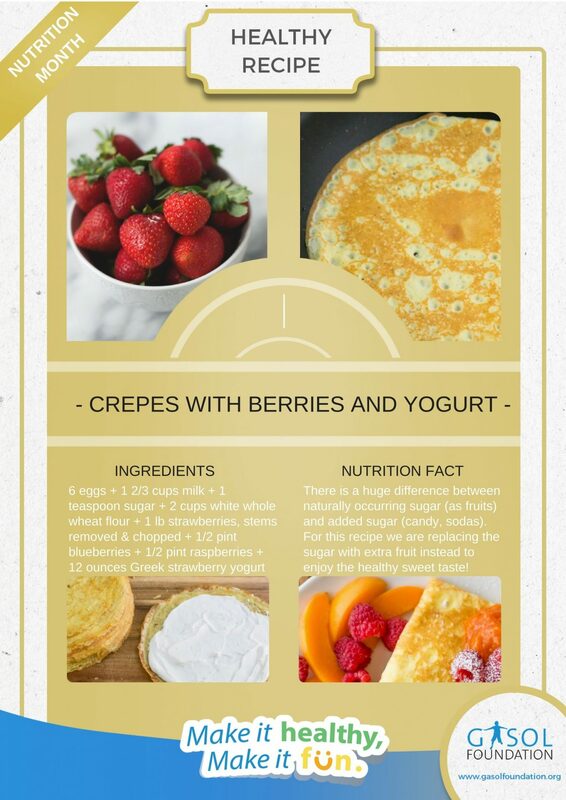 This particular theme conveys that whether you’re eating breakfast to start your day off, or fueling up from a meal before an athletic event, the foods you choose throughout the day can make a big difference. Preparing foods that can go further, for individuals and communities as a whole, can have a positive impact. Gasol Foundation wants to be part of this impact by helping people adopt healthier eating habits, while also reducing food loss and wastes. 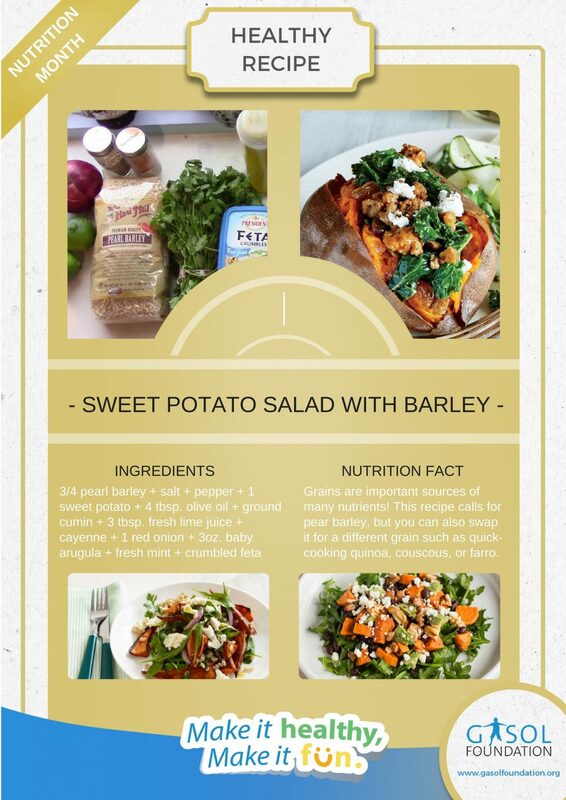 In order to help do so, in March we will be sharing simple, heathy, and delicious recipes throughout our social media channels. All you have to do is follow us on Facebook, Instagram and Twitter. The recipes that will be featured are all recipes you can prepare and enjoy together with your family! Encourage your family members to eat healthier one meal at a time! Bon appetit! While your cooking in the kitchen with your children, use the time as an opportunity to talk with them about the importance of health. Experts say the single most important thing you can do for your health is to cook at home. Inviting children into the kitchen and involving them at a very young age fosters a habit that will have lifelong benefits. Also, it gives you an opportunity to discuss with them how certain food can make you smarter (fatty acids) or how “eating a rainbow” ensures they are getting a variety of vitamins and minerals.